Allan Appel PhotoWarehouse Ensemble actors Madeline Wright, Ja’Quann Brantley, and Angelica Rodrigez. Motha Earth checks out Wisdom Warrior and his girlfriend Patti in the new booth at Uncle Kang’s Diner. That stuff she’s dabbing on her zits? It was intended to be a magical potion to take Wisdom’s mind off other girls. Turns out it works even better as acne cream. Welcome to the mythical yet teen-down-to-earth world of Hope High: Class of ‘84. It’s the first production of the Warehouse Ensemble, a group of 13 to 19-year-old teens and adult actors, a cast of 23 who open on Friday night at Long Wharf’s Stage Two. Their play was written, choreographed, and directed by Sharece M. Sellem and is being produced by the Bregamos Community Theater and its indefatigable leader Rafael Ramos. Ramos also presides over much unwanted drama as Livable City Initiatives’s head of housing code enforcement. In another first, Ramos is also acting in Sellem’s play. Uncle Kang, aka Rafael Ramos, at his diner with two of his favorite customers, Jaqui, played by Bianca James (in blue) and Roxanne, played by Diamond Jackson. He’s Uncle Kang, the owner of the greasy spoon that’s the center of life for the kids at crime and poor-condition plagued Cedar City High School. Performances are Friday and Saturday at 7 p.m. and Sunday at 2 p.m.
Click here to read about Sellem’s work as a performance artist and mime and her previously produced plays in town, which she mounts when she’s not teaching as the visiting artist at the Davis Street Arts and Academics School in Westville. The young actors, at least five of whom have never been in a play before, have been rehearsing at the pace of two two-hour sessions a week for the past six months. At Wednesday’s rehearsal, she was both full of praise and tough love, the latter because her thespians had been acting, well, like teenagers, and making too much noise during rehearsal. Stay in character from now on, she declared in remarks after the cast practiced their end-of-play bowing. “You’re in 1984. Put your cell phones away. They don’t exist. Be fully in character from now on. You’re an actor. It’s a profession,” she said. Sellem said her Warehouse Ensemble(WE) was needed because there was no active acting company for teens in the Greater New Haven area. This inaugural season the training for the kids has been largely acting, with adults pitching in, including the sets having been painted by Independent contributing writer David Sepulveda. Director Sellem on the right with Uncle Kang. In the future, Sellem said, she hopes to expand the training so kids in the WE will also learn props, set design, and the behind the scenes of the theater world. “I’m an adult, but I feel like I’m a teen,” she said. Sellem said at the heart of the play is her interest in the complex relationships among kids—wannabees, the pseudo-revolutionaries, nerds, jocks, who’s in and who’s out. As the cast gathered their costumes and props and made final checks as to who’s in charge of what for the performances, Uncle Kang threw in another assessment: “I’m not an actor, but I’ve learned a lot in six months. We’re family now. Let’s have fun,” he said. 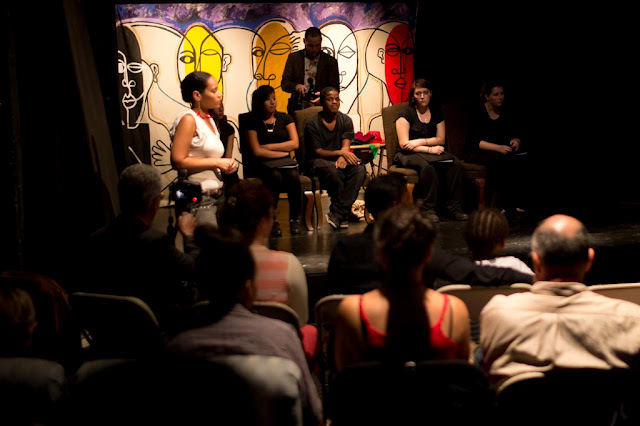 “This event was a stage reading of “Last Chance” which was presented by Inner Theater Creative Arts Workshop. “Last Chance” was written and performed by teens who have participated in the Connection Inc.’s Inner Theater Creative Arts Workshop. This story reveals one teen’s life on the other side of substance abuse. A dealer and a talented poet, Chance gives his insight into his tough balancing act. “On September 15, The Inner Theater Project in conjunction with Bregamos Community Theater presented “Last Chance,” a stage reading of a work-in-progress, written by young thespians under the guidance of Director-Choreographer Sharece M. Sellem, who is also the Drama Instructor for the Dramatic Dreamers Drama Club at Davis St. Interdistrict Arts & Academics Magnet School in New Haven. 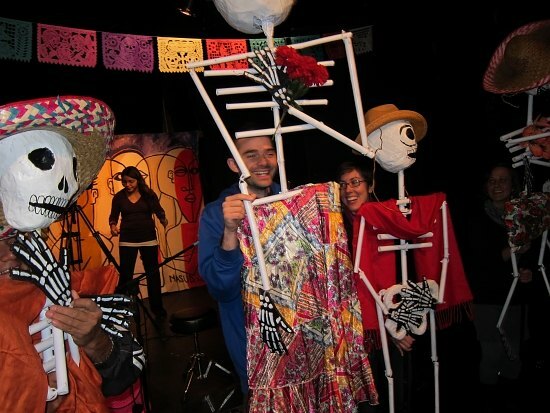 Bregamos, now in its 12th year of providing and promoting quality community theater, operates out of a “spot that nobody wanted,” according to its founder, Rafael Ramos. The theater, located in building 8 on the back side of Fair Haven’s Erector Square Complex at 315 Peck Street, continues its remarkable work as resource and facility for theater groups, community events, activities, and programs. With scripts in-hand, actors incorporated movement—spontaneous and choreographed—while reading their lines, infusing them with all the theatrical passion and pathos one might see in a polished production. A narrator off-stage, weaved the scenes together by adding technical footnotes, that in an actual play, would set the scenes and direct the action of the players. After the readings, director Sellem elicited questions and received thoughtful comments from the audience that will help shape the script, develop characters and refine the message going forward. Some expressed appreciation at having such a great arts-based facility in right in their community. “Last Chance” was made possible through a collaboration with The Connection Inc. Preventative Services, an agency that is focused on prevention of a spectrum of drug use in New Haven, while building and sustaining “healthy and caring communities.” To that end, the organization partners with youth, faith-based organizations, schools, businesses, human service organizations, and in this case, community theater. Gerardo Gorskin of The Connection Inc., applied for the original grant funding for the project. Indeed, the script’s protagonists are not unlike some of the play’s actors who have discovered their talents for acting, performing and writing only recently, and who have found a creative and therapeutic outlet in which to channel their energies. After the reading, actors shared personal stories of how they connected with the acting workshop. Jessica Felaro (“Uncle,” “Morrison” and “Sully”), a multi-talented sophomore at Magnolia Academy in Cromwell, Connecticut, said she came by the program quite by chance after finding a flyer announcing the program. Other actors included were Elvin Rivera, Suzette Briones, Jessica Williams, Ariana Vecarro and Kimberly Rivera, who read her impassioned,original poem “Dig Deep” at the program’s outset. Some of the original program participants did not stay with the program to this point in the project’s development, but Sellem noted that their voices are still reflected in the script they helped develop. “Skeletons rattled their PVC bones and the dead had plenty of sugared bread and wine piled high on their altar to enjoy themselves, as the Fair Haven Latino community’s Día de los Muertos carnival and parade came off without a hitch. But it came off indoors, not outdoors, due to Saturday’s surprise snowstorm. Organized by the workers and immigrants rights grouop Unidad Latina en Accion, the Day of the Dead parade was scheduled to originate in Criscuolo Park Saturday late afternoon. Then the stormy forecast forced a rescheduling of the parade to Bregamos Theater Company in Erector Square for a briefer march. The altar of the dead, with edible sugar skulls, bread baked in bone shapes and a bottle of “Bohemian Highway” California cabernet sauvignon. However as the slush accumulated citywide, the skull-and-rib-cage-bearing revelers, including playwright Aaron Jafferis, stayed indoors, some 50 strong, to party and promenade around the theater company’s space all decked out with an altar for the dead and a stage for the living to perform. On Sunday organizers decided to do it again—outside, for real. They planned to meet at 5 p.m. at Bregamos for the outdoor promenade. Joining the puppets is this huge fan of the Santa Fe, Colombia, soccer team created by Jennifer Mendoza. Among the partiers Saturday were Natalia Houghton and her daughter Kaia along with a spiderman. Because the spiderman was having trouble with his hood, he preferred to remain anonymous. Houghton had on a witch’s hat and colonial shoes with sparkly glitter on her buckles. Kaia was dressed in what appeared to be a quilt with South American indigenous designs. Their combination costumes caught the spirit of the Day of the Dead, which seemed to embrace dressing up, letting it hang out, and defusing the terror of dying by, well, just staying in touch with dead. “A drug dealer is coming to Fair Haven tonight looking for JaQuann Brantley—carrying a bullet with Brantley’s name on it. Fortunately for JaQuann Brantley (at left in photo), that lethal action is taking place not on the streets but the stage. Not that Brantley is unfamiliar with the rough life of the streets. The 20-year old from the Dwight neighborhood has had friends and acquaintances shot dead in turf and drug battles that were the tragic culmination of often petty slights or jealousies. He has avoided that fate. But he has also had an unsettled life including bouncing among several foster homes. Now he may have found a home in the theater. Fair Haven’s Bregamos Community Theater, to be precise. Brantley is one of the stars of Momma’s Boyz, a gripping story of three friends caught up in the drug life. It debuts Thursday night at the Erector Square theater; performances run through Sunday. “He’s a gem for us,” said Rafael Ramos, the play’s producer and the founder of Bregamos. Ramos met Brantley at a dinner where the young man was performing poetry. Although he had had spoken word experience, mainly at city venues with open mikes, Brantley had never acted. The play, written by Candido Tirado, premiered at New York’s Hip Hop Theater Festival in 2002. It has won various awards. In the Fair Haven production, Brantley plays Shine, a young dealer who gets in a jealous competition with his mentor in drugs, Thug, over who can sell more bags. Shine can see beyond the drug life, but Thug can’t. The younger dealer becomes an obstacle for him and eventually shoots him dead. “The events in the play are everyday life for me,” said Brantley. “My friends in the hood, they get popped for dumb stuff. The dirt never disappears. It catches up to you and turns into a mountain,” he said on Wednesday night in a break at tech rehearsal. How was the play experience different from real life—or, rather, what is the novice actor getting out of the role? “We’re stuck in time,” he said. And yet there is also a force at work, a kind of cosmic agency for good that gives people a second chance. In short, even in the most dire circumstances there is always a choice. Brantley was referring to the plot structure of Momma’s Boyz: The opening scene has Thug kill Shine. That’s the culmination. Yet it didn’t have to be that way. There’s a decision to be made, and it could have gone the other way. Nothing is preordained. The play makes that point by going backwards in time, so that the very last scene is the first that chronologically or causally occurred. And Shine is shown making a different decision. A better decision about his life. Had he chosen well, he might have lived. Of course, then there would not have been a play, or at least not the one we have seen. The play enjoys poetic energy of the kind that Brantley possesses in abundance. He plays with a prickly vulnerability so nicely off the more experienced actors, Akintunde Sogunro as Thug and Gabriel Hernandez as Mimic (pictured right and center in top photo). Hernandez was last seen in 2007 as Bregamos in Aaron Jaferis’s Kingdom. In this scene in the video clip, we see the three pumped up pals engaged in a jealousy-fueled verbal battle over customers that will culminate in Shine’s shooting death. The play is also the debut of Bregamos’s refurbished theater space. There are serious new theater lights, a tech booth with sound and light control boards and a modular seating capacity of up to 199 people. Ramos said the theater was configured for 99 people for Momma’s Boyz; he hopes it will be filled. Shows run from Thursday through Saturday, at Erector Square off the Blatchley Avenue entrance, with an 8 p.m. curtain. Sunday’s matinee is at 3 p.m. For tickets email here or call 866-631-880, extension1. “Given the number of homicides of young people related to the drug trade,” Ramos said, he could not ask for a better play or more eloquent young players to launch the new house. Brantley replied that the audience is seeing in the play only half of what really goes on in the streets. “There’s an element you can’t portray even in a good play,” he said. “A local playwright’s hip-hop musical about the Latin Kings, produced by this local hero’s community theater group, has been drawing crowds to Fair Haven—including an elected official wrestling with the issue of youth violence. Read on to find out what she plans to do next; and click on the play arrow above for a snippet from the show, in which Latin King recruit Andres (Gabriel Hernandez) vows revenge for a gang murder. The play is called “Kingdom.” Aaron Jafferis, a Hillhouse and ECA grad, wrote it based on the stories of New Haven Latin King gang members. It had a celebrated run of performances in New York. Now it’s playing in New Haven, through this weekend, at Fair Haven Middle School. Bregamos Community Theater, which city housing inspector Rafael Ramos (pictured at top of this story) runs in his spare time, is staging it. Click here to read Allan Appel’s interview with Ramos and Jafferis. Saturday night’s sold-out crowd included Downtown Alderwoman Frances “Bitsie” Clark. Clark, who for many years ran the Arts Council of Greater New Haven, saw “Kingdom” in New York. Click on the play arrow to hear her reaction to seeing it again in Fair Haven. Clark has devoted considerable time the past few months running hearings and meetings to consider how to tackle youth violence in town. Moved by Saturday’s performance, she said she plans to e-mail all her fellow aldermen to urge them to catch “Kingdom” this weekend. The mayor, too. The play portrays the influence of the Kings on rootless young Latinos as similar to the influence of another militaristic gang that aggressively recruits them with pie-in-the-sky promises: the U.S. military. Both recruiting organizations end up promoting a never-ending cycle of violence in the false belief that only more killing can stop killing, that urban kids abandoned by family and alienated from mainstream society can find “freedom” and security through a militaristic group. Notions like peace or human rights represent a threat. They come to equal heresy, disloyalty. “Working in close quarters, five Latina immigrants dodge immigration officials and pursue green cards while they work to keep their small business alive. The setting is 1987 Los Angeles, but the immigrant story of the latest Bregamosproduction fits right in to 21st century New Haven. The set is small and intimate, but busy with color and clutter: a floral couch, spools and spools of thread, a sewing machine, draped manikins, a fridge, toilet, deodorant, toothbrushes, a coffee pot, a bright pink radio. Late Monday afternoon, the set was still a work in progress. As he waited for the cast to arrive for rehearsal, Rafael Ramos, the director of Bregamos community theater, fiddled with lights, drilled in a set wall, inserted a shower rod, and tried to get a hold of some wire to secure it in place. The play takes place during the enforcement of the first amnesty laws in California in the late 1980s. This immigrants’ story clearly resonates decades later. “New Haven is a place that has tried to embrace our immigrants, especially recently with the ID card program, and that’s something that looms above this play,” Soto said. In Kingdom, Soto (pictured) was one of the only women in the cast or crew, as compared with the all female cast of five she is now directing. “It’s just been really great, being surrounded by females, and having that be the focus and the power,” she said. Maria Nunez, who plays Carmen, hadn’t acted in 15 years, but decided to take a chance on the audition. “The next thing I know, my niece is calling me saying we are in!” Her niece, Pierrette Silverman, plays Carmen’s daughter, Estela. Silverman, a patron of Bregamos who has never acted before, said this is something she has always wanted to do. And as the vice-president of Planned Parenthood, she has found Real Women a great place to start. “In this play in particular, there’s a lot around the right of women and their reproductive choice, and so that resonates with the work that I do on a daily basis,” she said.